When Vermont Farm Table shuttered its store in downtown Burlington this fall, after selling its wooden wares there for six years, customers wondered: Was the small manufacturer doing OK? Would it stay in business? Would it have another store downtown — or anywhere? The answer to all three questions is a definite yes, according to owners Dustin and Jessica Glasscoe. VFT is not just surviving but thriving, they say. In January, the company will celebrate its 10th anniversary with plans to expand into a larger production shop and new stores in Burlington, Boston and perhaps other major markets. 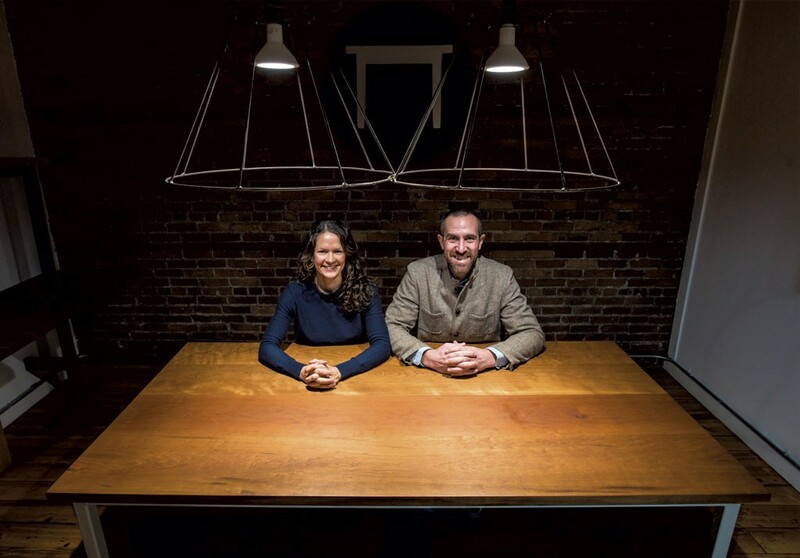 On the day after Thanksgiving, the owners launched their first full-scale product line: a selection of real-wood, ready-to-ship dining tables that come in a box for buyers to assemble at home. They consider it a turning point for VFT. Revenues are expected to reach about $5 million this year, Dustin says. VFT has delivered custom-made furniture to homes and businesses across the country, from cottages in rural Vermont to renowned restaurants in big cities, and even to the executive offices of investment bank JPMorgan Chase & Co. The closure of the College Street store was disappointing; it resulted from a disagreement with the landlord, according to the Glasscoes. But it has allowed them to seek more space for more products — the previous store could barely fit two tables — while continuing to interact with customers, glean feedback and boost the company's profile. 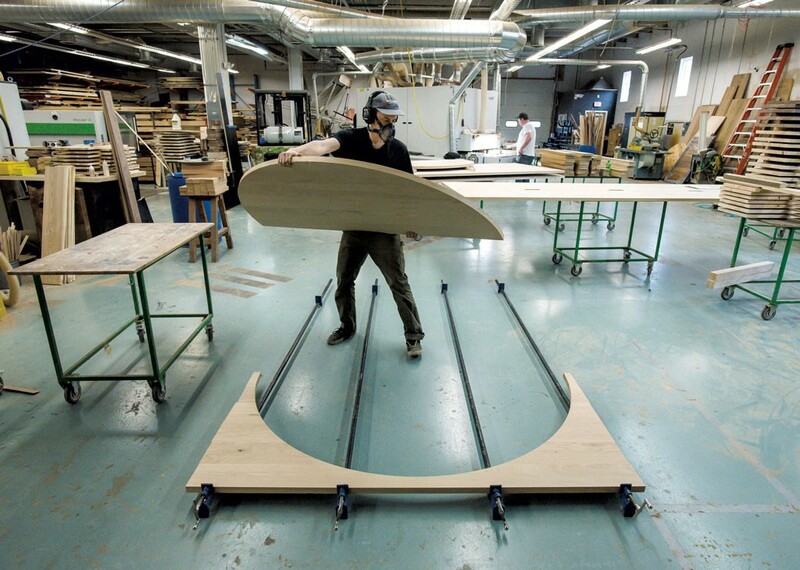 With its woodshop in Bristol and offices in Burlington, VFT sells primarily through its website, but face-to-face interaction is fundamental to its product and philosophy. The Glasscoes make tables, sure, but they also hope to make change in the world by encouraging people to come together. At their home in Charlotte, the two are adamant about cooking and sitting down for dinner with their three children — ages 9, 7 and 1 — every night. "We're all glued to our devices, and we're not connecting one-on-one with real people," Dustin laments. He cites VFT's internal mantra: "Gathering changes everything. Gathering makes you see eye-to-eye with people." The Glasscoes developed their business to diverge from the cost-focused ways of big corporations. Unusually in the furniture industry, VFT mills its own wood only from domestic sources and finishes its products by hand. The company is modeled after manufacturers such as Patagonia and Seventh Generation — companies with a conscience and a pledge to value their workers and the environment as much as profits. That's the "triple bottom line," Jess notes. "There's a chord of sustainability running through it, and it's not just all about profit and excess," she continues. "We're really against throwaway culture. We wouldn't want to ever be at a company where we're making products that ultimately end up in a landfill or are designed to end up in a landfill." Every VFT piece is custom-ordered, with the exception of the new ready-to-ship tables. For those, customers choose among two styles, two sizes and three woods. They range in price from $1,000 to $2,200, compared with $2,000 to $10,000 for VFT's custom tables. The goal is high-quality, real-wood furniture delivered fast for an Amazon-accustomed market. "So you can order a table on Monday and have a dinner party on Friday," Dustin says. At the suggestion that this sounds like a certain Swedish multinational with ready-to assemble furniture, the Glasscoes hardly flinch. Even before they launched VFT, this was the concept they envisioned: IKEA — only better. "With the new boxed product, it is the same table" that VFT makes for custom orders, Jess says. "We're trying to bring some efficiency and some scale to what we do, but it's the same quality, and it's the same process to build the table." The Glasscoes met in an entrepreneurship class at the University of Colorado Boulder. On their dates, they wrote business plans. Dustin worked nights cooking in restaurants around town. Soon the couple moved to Winston-Salem, N.C., where Dustin had grown up on a farm; his dad was a custom home builder who taught his son woodworking and made the couple's first dining-room table. Jess worked in marketing at Whole Foods Market. They liked the idea of a food-production business and relocated to Vermont partly for its locavore leadership, even after visiting on a freezing January day in 2008. Within a couple of weeks, Jess had a marketing job at Seventh Generation. Dustin continued working remotely, doing website development and digital design for a North Carolina garage-door manufacturer. Tables seemed like a natural extension of their food fascination — focusing on where, rather than what, people eat. One day, while fooling around on the internet, Dustin discovered the domain name "Vermont Farm Table" was available and set up a website. Two days later, he had an order from a woman in Oregon. "Then I panicked," he says. He had no workshop, no equipment. But he was in Vermont, surrounded by local builders looking for business in the wake of the housing crisis. Dustin found a woodworker to make the eight-foot reclaimed-pine table that went to Oregon. Another of VFT's first craftsmen still makes some of its products. In those early years, the Glasscoes did business out of a rear room in their Charlotte home. They served wine and cheese, played classical music, and sat down with customers who drove up from Connecticut or New Jersey to design their tables. Many have come back for multiple pieces. In 2011, VFT opened the Burlington store, initially in another space across College Street. Four years into the business, with sawdust coating nearly every surface in their house, the Glasscoes moved production to the Bristol Works! industrial space with five full-time workers. Now VFT has several equity investors and employs a staff of about 20. The company marries the elements of fine craftsmanship — attention to detail, top-quality materials and hands-on fabrication — with state-of-the-art technology. VFT bought two of Dustin's "dream machines" in the past year. One does precision cutting of everything from hand-paddle wooden cutting boards to 17-foot tabletops. The other is a planer/sander that can smooth a surface in just two to four rounds, compared with 25 to 30 rounds for older machines. The wood arrives rough-cut before VFT does the milling. Two weeks ago, a pile of cherry in the woodshop still had some of its bark. Customers can get any wood that can be domestically sourced. One VFT specialty is "tap-hole" maple from retired syrup-producing trees, which would otherwise be discarded because the taps can leave traces of metal. VFT fills the tap holes with a black epoxy, scattering spots across the surface that complement the bruising that happens when the trees are tapped. VFT prides itself on a "soup-to-nuts, start-to-finish" process with "all raw ingredients, like a great restaurant," says Dustin, the former chef. "And we finish it all like a great dish." VFT staffers do the final sanding and coating by hand. They apply oil and wax for a natural look, or brush on a shiny Vermont Natural Coatings polymer made of whey left over from cheesemaking. Many industrial furniture makers spray a lacquer finish, requiring employees to wear protective suits to avoid breathing the fumes, Dustin notes. Until about 18 months ago, residential customers accounted for the majority of the company's sales, Dustin says. Now, commercial contracts contribute 80 percent of VFT's business. Those customers include Google and Verizon, which has placed VFT tables in its offices around the country. Women's clothing chain Ann Taylor Loft uses VFT tables for store displays. The Campbell House Lexington, a new bourbon-themed Hilton hotel in Kentucky, has ordered a variety of pieces. For commercial clients, a VFT employee based in Boulder renders digital designs. If the customer approves them, the company provides a quote within 24 to 48 hours — less than half the time most manufacturers require — using software Dustin designed, he says. The program crunches every configuration and tweaks the specs so the company doesn't need to build molds or prototypes. It's a faster way to do custom work, where every order is unique, Dustin explains. "We are really a tech company that makes furniture," Dustin suggests. Expecting a huge boost in business from the ready-to-ship line, which still awaits a brand name, VFT added a six-person sales team this summer and hired its first chief operating officer last month. Even as a bigger company, VFT will hang on to its basic ideals, Jess insists. "When you grow and scale," she says, "your ability to effect change is also that much greater." The original print version of this article was headlined "A Gathering Place"